Zylkene is a natural product given in capsule form to relieve stress in dogs and cats. 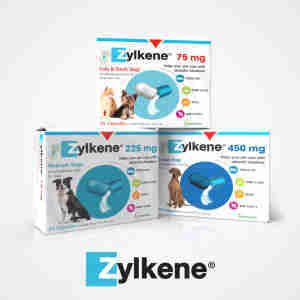 Zylkene contains a natural product derived from a protein found in milk, and works to support your pet when they are feeling stressed or vulnerable. It comes in powder form, packaged in capsules which can either be fed whole or opened up to mix with your pet's food. It is designed to be fed to your pet once a day with a meal or treat. The ingredients have a positive impact on the brain receptors, helping to soothe your pet. Since Zylkene is a natural product that has little to no known side effects, you will generally be able to feed it to your pet for as long as they need it. This makes it an effective solution to your pet's stress, whether this is related to a short-term change such as a house move or unfamiliar visitors, or more permanent circumstances like being left alone during the day. Animals react to stress in different ways, so it's important to learn to recognise the signs in your pet. You might find that your pet becomes withdrawn and hides when faced with something frightening or unfamiliar; other pets can become aggressive or engage in destructive behaviour. If the cause of stress is temporary, your pet will often return to normal once the source is removed. However, permanent changes such as a shift in routine or a new pet in the house might need you to take further action to reassure your pet. Bought for my elderly labradorX who gets very stressed when travelling. Persevered for a month to give it a fair trial but no effect whatsoever. Easy to use. Tried a number of other products but without success. My 14 year old neutered Tom, started spraying indoors recently. I aslo have 2 spayed females. As you can imagine, it’s been a nightmare! The vet said it could be anxiety and prescribed Zylkene and said it works for some cats. Well it’s worked for my boy, thank goodness and I’m now buying it online for convenience. Between Zylkene and a lot more cuddles and attention from me, my boy is now fine. Highly recommend! Much cheaper & easier to buy these online here compared to at the Vets. Delivery is also free, quick & reliable. My Chihuahua has got very growly towards his mate when he's sitting on my lap and & guarding me. I only give him half a day a whole for a 3kg dog made him skulk off into the corner and although he still has the occasion grumble, he's lost the terrible fighting talk he'd adopted. Super stuff!